A mourner during a vigil in Atlanta for the victims of the mass shooting an Orlando nightclub on Sunday. Hillary Clinton and Donald Trump have already responded to the deadliest mass shooting in U.S. history, which occurred Sunday morning at a gay nightclub in Orlando. Indeed, the massacre, carried out by a man who swore allegiance to the Islamic State, will reshape the dialog around the presidential election, in the short term at least. But the truth is that we don’t know how the tragedy will affect the race, and we should be careful about making too many conclusions based on the polls too soon. 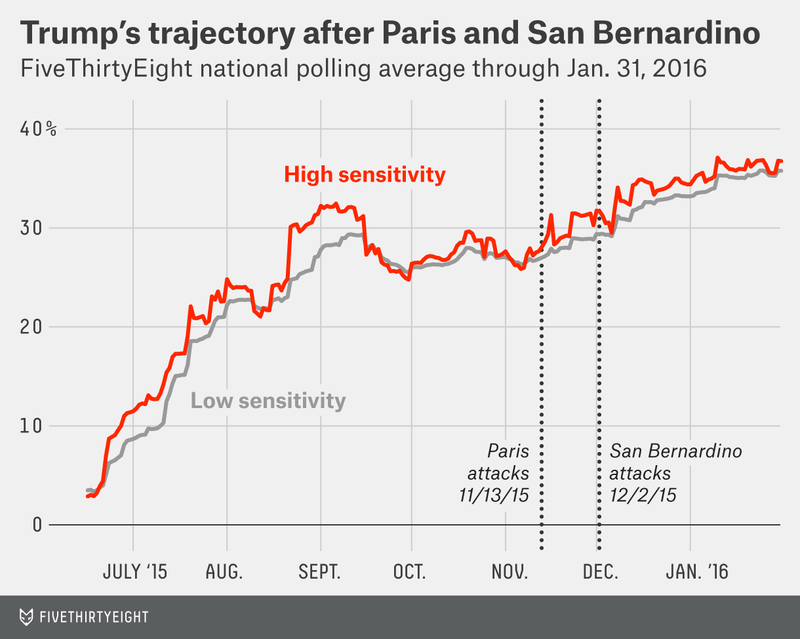 Trump’s support rose in Republican primary polls in the wake of the terrorist attacks in Paris and San Bernardino in late 2015. As my colleague Nate Silver wrote, Trump voters reacted positively to his calls for a temporary ban on any Muslims’ entering the U.S. and tougher restrictions on immigration more generally. Trump won a far higher percentage of the vote during the primaries among people who listed immigration as the issue most important to them and among those who favored a temporary ban on Muslim immigrants. But, as Nate pointed out at the time, it’s difficult to tease out exactly how much of a bounce Trump really got. Moreover, Trump’s support didn’t move much after the bombings in Brussels in March, which suggests the voters disposed to favor Trump due to the threat of terrorism may have already moved into his camp. That is, voters are now aware of Trump’s positions, and he may not have any more ground to gain. This leads to a second point: The general election electorate is much different than a GOP primary electorate. Just because Trump gained support among Republicans after a terrorist attack doesn’t necessarily mean he’ll gain among voters at large. Trump, for instance, saw his favorability ratings among Republicans go up during the primary, while at the same time they went down among both Democrats and independents. You can see this split between the Republican and general electorate on specific issues, too. In the most recent ABC News/Washington Post May poll — which found Trump leading Clinton in the horse race by 2 percentage points — just 43 percent of Americans favored a temporary ban on Muslim immigration,1 compared with 64 percent of Republicans. In the same poll, Clinton was more trusted than Trump on immigration, 51 percent to 42 percent, while Republicans favored Trump on the issue 83 percent to 11 percent. That brings up point No. 3: There are a lot of directions in which this debate can go. Orlando involved a lone gunman, who swore allegiance to ISIS but didn’t have strong ties to it. The attacks involved a legally purchased gun and occurred at a gay nightclub. This was a mass shooting, a terrorist attack and a hate crime, making it hard to predict how the American public will react. Clinton, for her part, will likely try to make this debate about who is best prepared for a crisis. Polls show Americans view Clinton as better prepared than Trump is to deal with an international crisis. In the ABC News/Washington Post poll from May, she led Trump by 19 percentage points on this question. She also led Trump on who was more trusted on “social issues such as gay marriage and abortion” by 33 percentage points in a Gallup survey conducted in May. Trump, meanwhile, repeated his call for a Muslim ban, on which the polling is more split. In comments on Monday, he repeatedly invoked the dangers of “radical Islam” and said “we have to control our borders,” essentially combining the two issues. Trump might also push the debate toward gun rights and the Second Amendment — an issue some of his supporters have already brought up and one on which he was slightly more trusted than Clinton in the May Gallup survey. On the broader issue of terrorism, Clinton holds a slight advantage in some surveys, while Trump does in others. Because they have different strengths and weaknesses, Trump and Clinton are likely to try to frame the post-Orlando discussion much differently. Finally, point No. 4: We may never know how exactly the Orlando attacks affected the 2016 election. The polls right now aren’t steady. Trump seemed to gain ground after he vanquished Ted Cruz and John Kasich from the race in early May. But over the past three weeks, Clinton has regained some of the edge she had lost. Now that she has become the presumptive nominee and Democrats bigwigs are rallying behind her, Clinton should theoretically be able to widen her advantage over Trump as some — perhaps most — wayward Bernie Sanders supporters pile on the bandwagon. If the polls, in fact, don’t move over the next couple of weeks, it could be a sign that the post-Orlando political environment is helping Trump. Or, it could also be the case that the bulk of Sanders supporters were never going to back Clinton (or are waiting for him to formally endorsement her). If nothing else, the attack reshapes what was going to be a unity week for Democrats, with Clinton meeting with Sanders on Tuesday night and an already canceled Clinton/President Obama rally in Wisconsin on Wednesday. Of course, Clinton may still pick up ground. How much of that is a presumptive nominee bounce versus that Americans think she is a better leader in a time of crisis? That’s going to be a difficult puzzle to solve. I only used very specific questions trying to mirror Trump’s words on the issue. Any deviance or further explanation of Trump’s position from pollsters can bias the question.